We’re No Heroes are the indie kids who always had a secret hankering for their mum and dad’s Nile Rodgers-produced disco records. They’ve been compelling movement in hitherto resistant bodies on Cardiff’s music scene for a couple of years, distilling Chic, Liquid Liquid, Friendly Fires, Jungle and a hundred luminous melodies into the headiest brew. For reasons that aren’t yet public knowledge, this Cardiff-based trio formed in Chicago. They have more in common with the DFA-inspired sounds of the early years of the millennium (The Rapture, Radio 4 et al) than they do with most of their contemporaries, and it’s invigorating to hear a band whose sound is aimed as much at the feet as it is at the heart and the brain. 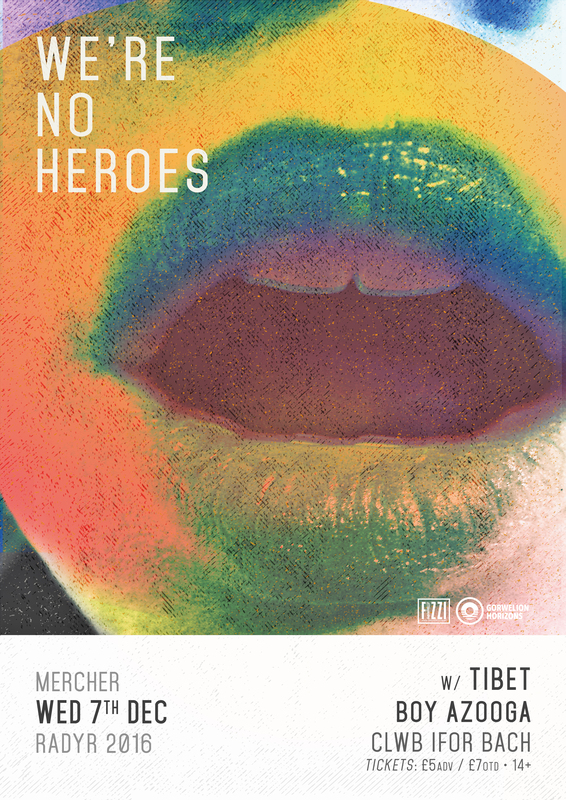 Although dancefloor-focused, We’re No Heroes songs are songs, as opposed to chants. The lyrics detail the darker corners of life, giving their grooves a real gravitas. We’re No Heroes have played alongside Peace, Public Service Broadcasting, Catfish and the Bottlemen and Future of the Left. They would not have been an easy band to follow onto the stage. Every time critics and observers write obituaries for the guitar, a great guitar-toting band ride over the horizon to thrill those of us who are more interested in great songs than facile predictions. Cardiff’s Tibet are one of those bands. Their energetic and tuneful songs – a Kinks for the 3rd millennium – have won enthusiastic support on Radio 1 and Radio X. Two members of the band are brothers – Joel and Ethan Hertz – which always brings an interesting chemistry to proceedings. Tibet are named after a line in Twin Peaks, and – fittingly – nothing in Tibet is quite what it seems. Just as you may be tempted to think that they’re one in a very long list of bands who are trying to defibrillate the 60’s, there is an unexpected shift or a lyrical twist very much inspired by the contemporary world around them. Boy Azooga is the recording project of Cardiff born musician Davey Newington. Whilst playing drums for various bands over the past few years (Houdini Dax/Monico Blonde, Charlotte Church’s Late Night Pop Dungeon, Keys, Gulp) Davey has been writing his own music and recording it at friend Eddie Al-Shakarchi’s house. The songs of Boy Azooga are packed with colour and a love of all kinds of music from the Beach Boys, Sly & The Family Stone, Caribou, Black Sabbath, William Onyeabor, Pond, Can, Outkast, Ty Segall and so much more.